In Chicken Attack Deluxe the crazy chicken from Chicken's Revenge is back on the warpath with vengeance. If you like this free game, try Ancient Ball: Curse of Pharaoh. Defending her chicks in this Magic Ball style game, this mama bird won't put up with any fowl play when she's defending her brood. Non-stop action will put your reflexes to the test as you battle to save the little chicks! Prove your skills as you team up with our heroic hen to defeat a world of crazy guys and evil beasts! - Unique Power-ups and Characters. 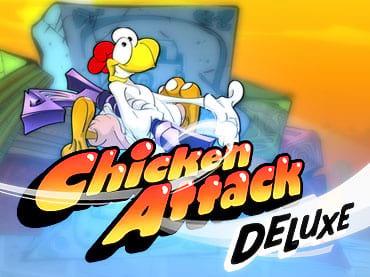 If you have questions about Chicken Attack Deluxe game, please contact us using this form.